PLEASE NOTE: The YEStation EXT (27XX) Family of Thin Client Terminals are no longer manufactured. The current equivalent replacement is the Computer Lab International (CLI) AG6601 Thin Client Terminal. Click here for other CLI models available for use as "Ethernet Terminals". New 122-key keyboards are available for your current Affirmative Thin Client Terminals. The YEStation� EXT is the midrange member of the Affirmative family of thin clients featuring wired, wireless, fixed, and portable devices. All models support PC peripherals such as printers, modems, monitors, keyboards, and pointing devices. Windows CE models include a local IE 6 Browser while Linux models include a Mozilla Browser. Affirmative Thin Clients are ideal terminal replacements and, less costly, reliable alternative to PCs. There are no moving parts and the Mean Time Between Failures is well over 12 years. Thin Clients are often used in challenging environments where dust and airborne contaminants are a problem for PCs, but they are equally at home in office environments where attractive styling and quiet operation (no fans) are important. The exceptionally small footprint, when vertically oriented, frees up desk or bench space that is often in short supply. The YEStation� EXT standard colors are black and silver matching the current trend toward black monitors. Affirmative offers matching input devices including mice and specialty keyboards with layouts that enhance user productivity when switching between 5250/3270 legacy applications and Windows/Browser apps. Dual color-coded key caps keep users on track. Dimensions: 9.25 X 6.5 X 1.5 In. 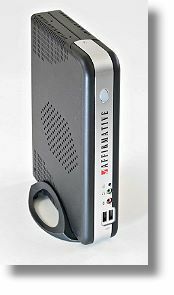 Thin Clients (TC) are an alternative to Personal Computers (PC) widely deployed in business operations. They are marginally less expensive to buy, but enormously less expensive to maintain. There are no disk drives to crash, no viruses, no productivity robbing games or movies, and no way for a user to transfer files (unless authorized). Simply put, a TC is a display terminal that can also support a local printer and other PC peripherals, such as modems. Display terminals allow the user to work with Windows, Browser, UNIX, and IBM Mainframe applications without moving any files to the desktop. This eliminates the need for users to backup their hard drives, eliminates unauthorized applications, and improves user productivity. All Affirmative Thin Clients feature a built in VNC server allowing administrators to �shadow� the terminal and take control, as if they were sitting at the users workstation, from any place on earth with network access. - Affirmative Exclusive Viewing Modes for IBM 5250 and 3270 Users. Choose Text, Windows, or GUI at no extra cost.